The Pendleton Together project in Salford, Manchester, is transforming the area with upgrades and new buildings. 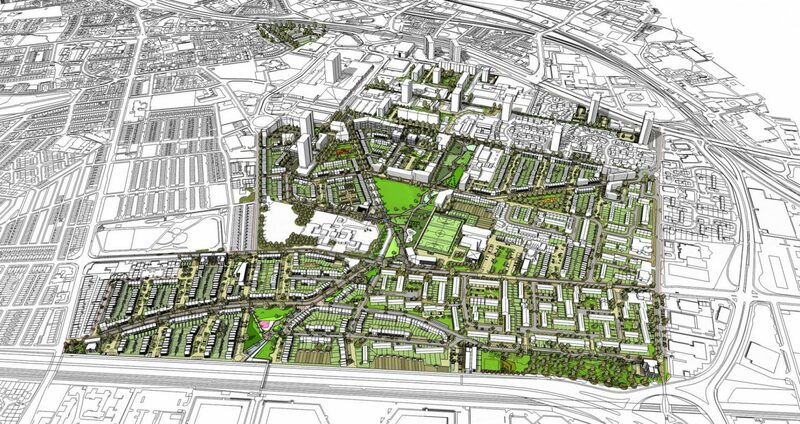 We prepared a competition-entry masterplan for 1600 new homes, offices, shops, extra-care homes, energy centres and a city farm along with the refurbishment of another 1200 homes and associated streets. Our masterplan was selected as the winning proposal. Our masterplan focuses on establishing Pendleton as a destination by improving permeability and links with the City of Salford. The link is achieved through a Green Corridor; a ‘spine’ that is attenuated by green spaces, public parks, play grounds, and other community buildings. Surrounding the Green Corridor is a series of homes, grouped into “Home zones,” which are designated pedestrian-friendly areas. Sustainable principles are embedded throughout the redevelopment strategy: Low-carbon buildings and construction strategies will be implemented in the scheme and the houses are designed to Code for Sustainable Homes level 4 for the first phases, 5 and 6 for later phases.